Affordable Accoutrements: Who gets the DISHES??? In a recent comment, Gloria of The Little Red House with the White Porch jokingly (I think!) asked me to adopt her, so she'd be "in the will" to inherit some of my dishes. I replied (jokingly -- I think) that it could be the theme of a post -- "If Bill gets hit by the proverbial bus, which china would you want?" Gloria assured me that I won't be hit by a bus (hope not, but you never know). I did somehow like the idea of letting readers weigh in on which china they'd like to inherit. So ... in a very informal poll (and it doesn't mean you're getting them! ), which dishes would you like to add to your collection? By the way, you can click on any of the photographs to see the original posts in which the dishes were used. Would you like something colorful and informal like the circa 1940s Blue Ridge set below? Antique French Limoges, marked CFH/GDM (Charles Field Haviland/Gerard, Dufraisseix and Morel)? Something from the 1990s you can put in the dishwasher. These are Charter Club Country Chateau. Colorful cobalt blue (the ones below aren't an option -- they were bought by a woman who plans to smash them to create glass mosaic tabletops). Homer Laughlin Jean (1944) -- the ones below were my mother's, and I used them in my first Tablescape Thursday post. Lenox Essex Maroon (1938-78) is one of my favorite patterns. But I also love the classic gold-rimmed Lenox H2 (introduced in 1911). Just to show you I DO actually serve food on my dishes (sometimes) ... Lenox Monroe (1983-2003). I picked up an additional Monroe dinner plate on eBay the other day. It's always nice to have extras, so it's not a crisis if one gets chipped or broken in use. Do you like mix-and-match place settings? These are a mixture of Theodore Haviland and Homer Laughlin. Or using the dishes as the manufacturers intended? These are Myott/Staffordshire Medici (probably 50s). The ones below are Noritake Laureate (Replacements, LTD says they're circa 1921 -- I would have thought 1930s based on the backstamp). More 70s china -- Noritake Trudy (these I've had since 1975 -- so long ago!). Royal Doulton Coronet (1957-79). I used these for my "Mad Men" tablescape! I used these for the "coronation" post I did for Queen Susan of Between Naps on the Porch! Syracuse Sherwood (1949-67). I bought the bird cages at an estate sale with these dishes in mind (and re-purposed them as tealight holders). 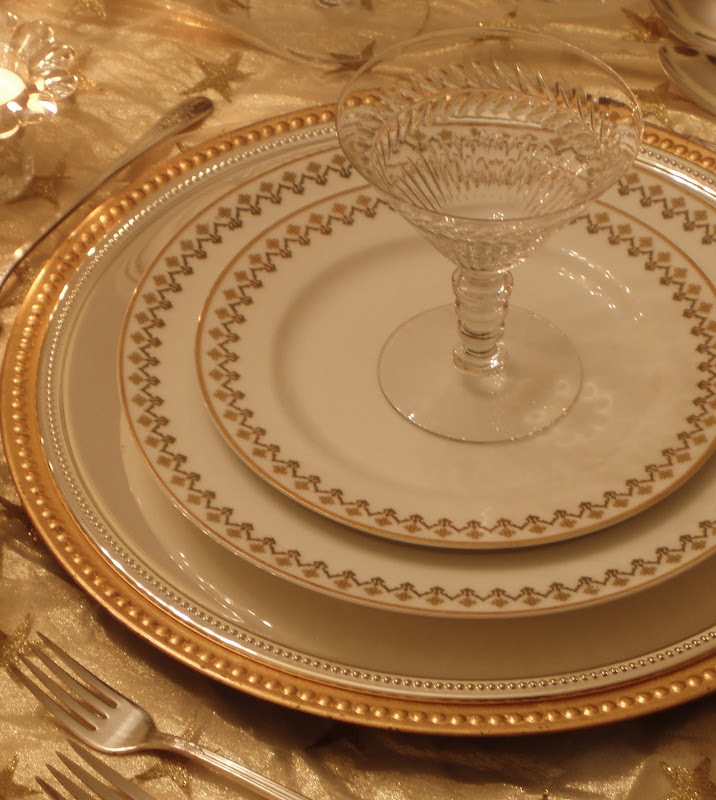 I do love the simplicity of gold-rimmed china, such as Theodore Haviland's Concorde (circa 1950s). For me, the scalloped edges and the mixture of a cream outer band with a white center add interest to this pattern. For simplicity with a touch of glamour, it's hard to beat Haviland Shelton (1952-85), with its cream body and platinum encrusted rim. Well, we've reached the end. That's all I have for your consideration today (but not quite all I have to show you -- stay tuned for future posts). It's time for Tablescape Thursday with Susan of Between Naps on the Porch! Please stop by and see Susan and all her talented tablescaping participants. If you'd like to leave a comment, just let me know which dishes you'd like me to put your name on. Who knows ... my heirs may prefer Fiestaware ... or (shudder) paper plates! So many beautiful dishes to choose from! I would (if I were your heir) choose the Paul Gosser American Ivy pattern. They just 'speak' to me! You are lucky to have had all these gorgeous dishes in your life at one time or another! I like the white and gold patterns but I also like the bird of paradise -- I have started to collect similar dishes (Wedgwood cuckoo, Aynesly Pembroke, Crown Staffordshire Roc Bird, Spode famile rose). But all your china is lovely and you have a great eye for good patterns. Love the versatility of all that you own. I'm with Martha, I love white and gold and was going to claim the Bird of Paradise until I saw the Medici!!! Figures. I already own Lenox Autumn. Thanks for the beautiful, fun post! Well, I couldn´t decide so... I want them all!!!! to keep them, to use them... and to enjoy them!! It would be awfully hard to choose, but I think I'd go with Theodore Haviland Mignonette (1951) - so elegant. So fun to see a smattering of your collections. Where on earth do you keep them all??? Well, I have a few that are similar to yours. I have a cobalt blue glass set that I use every day. LOVE BLUE! 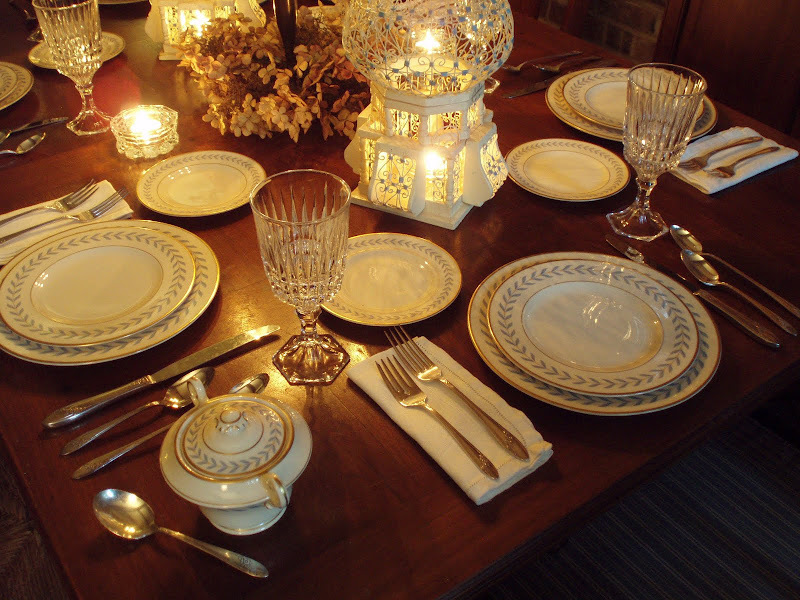 My wedding china is close to your 1972 Noritake...mine is Marseille....14 place settings and a jillion serving pieces. I also have enough of the Nikko Happy Holidays for an army...24 place settings. (each daughter will get 12 and serving pieces galore). 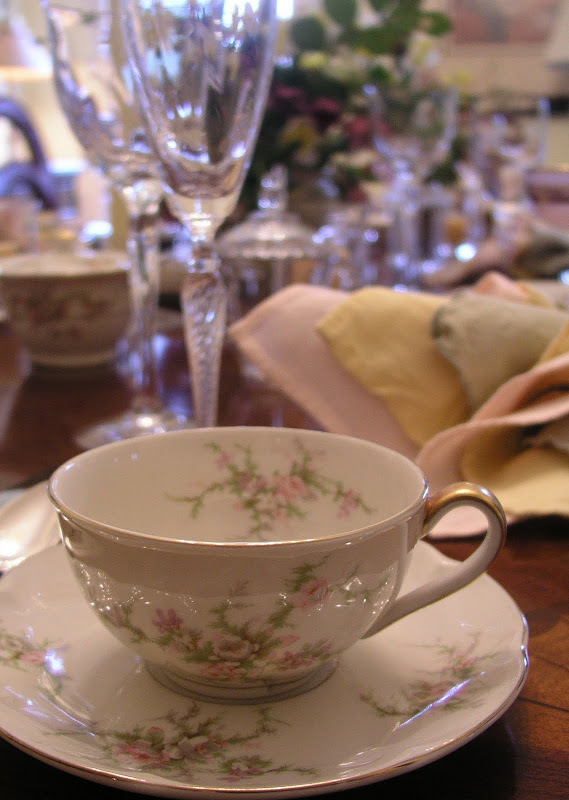 I have brought home my Mother's 1943 wedding china Haviland's Pasedena, which is very similar to your Mignonette. A cousin wants it, but she's not in Mother's will or MINE. Loved seeing all your china sets, but I am going to need a fork lift to pick my chin up off the floor. Great post. Without a doubt, hands down, it would be the Royal Doulton Prelude (1940-60). They will always be my favorite. I have loved since the coronation and there could never be another to take their place. Yep those are the ones. Now ofcourse we know you are going to be around much longer than me, and so I won't have to worry but ofcourse that would be my favorite pick of all time. You are such a joy to blogland. I love to come and see what you have to share, and I dream of sitting at just one of your beautiful tables to dine. What an honor and treasure. You are PHENOMENAL my friend. There will never be a tablescape as beautiful as yours. Beautiful post sweet friend. I thank you as always for allowing me to visit your table. 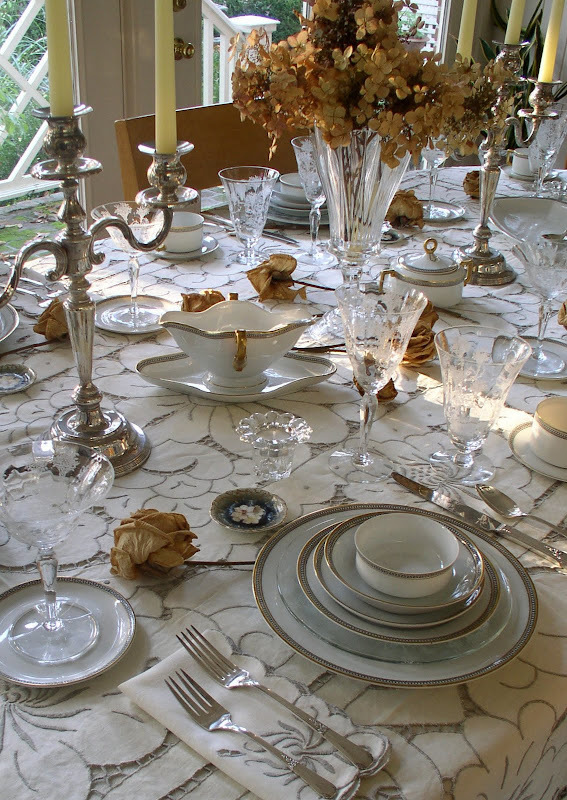 Oh my goodness I would happily accept any of them, your tablescapes are always so lovely. I can't help wondering how you store all of these precious treasures? 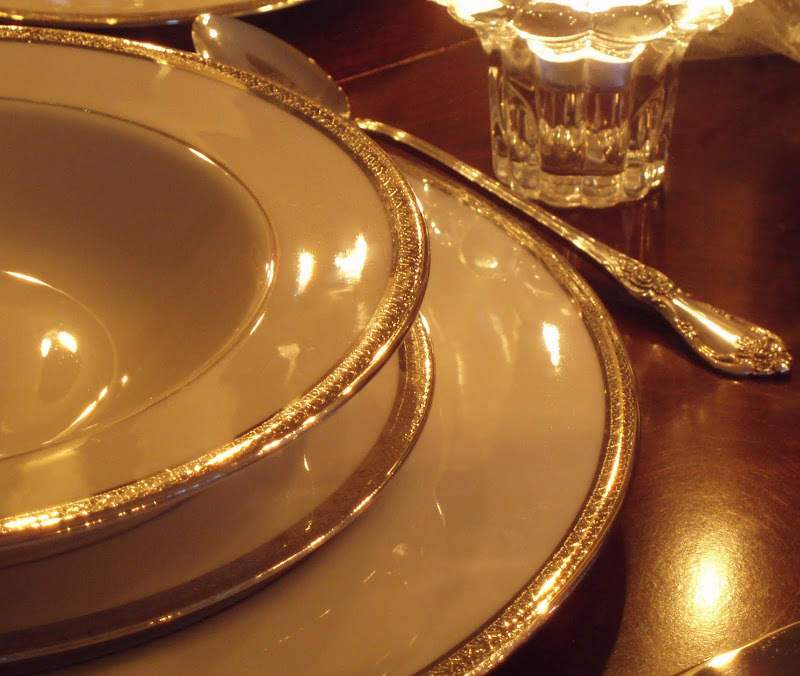 You have the most lovely collections of dishes and any would be wonderful to have, but what I would really love is the silverplate flatware you have paired with the Mignonette china. It is the same pattern that my "grandma" had. Sadly it went to my uncle's family. I was able to find a jewelry crafter who was selling bracelets from silverplate flatware and he had the pattern. I never thought much of it as a child, but now, that flatware brings back a rush of memories from Sunday dinners. Bill, don't even want to think of not having you around to share your creative tablescapes each week. And please, how could your heirs ever consider paper plates??? I love the Johnson Brothers English Ironstone dishes. Are they still available? I don't think you can ever go wrong with white dishes. They are so clean and lovely and seem to go great with anything. Bill, your tables are so pretty. Where in the world do you store all the dishes. I love the Royal Dalton Prelude. Absolutely gorgeous. I own the Rosalinde and enjoy using them, however, have never been able to get many of the serving pieces. Can't wait to see your fall tablescape, know it will be lovely. My Word~ what lovely collections and that's not all?! If you could add me to the will that would be great! I will take the Myott/Stafordshire Medici pattern with those sumptuous chargers. You have an amazing collection! Who wouldn't die for all those goodies? That is Ceekay.....make sure you spell it right in that will!! Oh, we are supposed to make a choice....you know, that is kinda like asking what is better cheesecake or homemade apple pie!! Something colorful and informal like the circa 1940s Blue Ridge set below? You have so many beautiful patterns of china! I think my favorite is your mother's china! You are a lot younger than me, so "give it" to someone younger! I also like the ivy china! Can't believe somebody bought the gorgeous cobalt blue to smash it!! Yuk! Cute post! You are always so creative! I have always adored your Lenox Essex Maroon, but prefer you standing upright and healthy and will be happy just to watch you use these dishes!! Since I cannot make up my mind, I want them ALL. I love china and I envy your lovely collection. Thanks for sharing! Well... the answer for me is "Yes" to them all too, but I actually do have a favorite. It's the Haviland Concorde with those scalloped edges. I have been seeking just the PERFECT china like that for a while. Some day, it'll leap out at me. So you can resist the urge to leap out in front of a bus to speed that along. I love your talent. Just love it. Oh my...I think I'll pick the Haviland Concorde. The turquoise would be so pretty at my house. You have quite a collection...all so elegant. May good health and wealth be with you always. 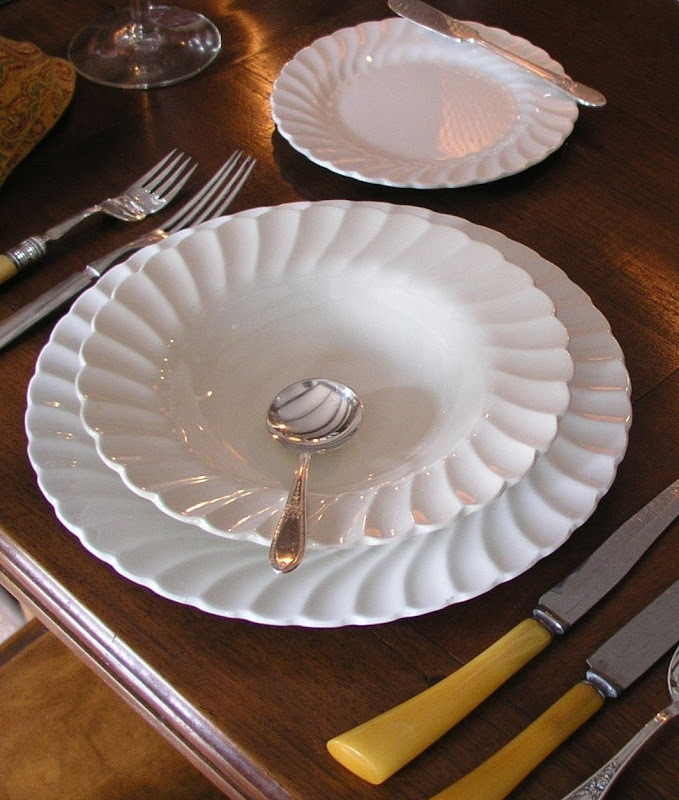 I love all your china but my English blood flows faster seeing the Johnson Brothers English iron-stone with the swirl pattern.That is my pick -- maybe I'll find some to buy. No one could choose from such a wonderful array of fine china! All unique in their own way. Your tables are amazing. My suggestion - at my house we use "if you were to be abducted by aliens" much better than the alternative! Bill- You are our "Justin Beaber". My friend and I always check your tablescapes first. We want to be your best friend or at least your neighbor! We loved the New Orleans post. And your tables are so special. Thank you so much for sharing with us. As horrible we'd all feel over your tragic bus accident; be sure to know that I would keep your memory alive while entertaining my dinner guests off of your lovely Noritake Laureate. I'd even set a place for you at my dinner table. Back in New Orleans, where we are from, we don't die but linger (wink). OH MY WORD! I WANT THEM ALL! Okay, I had to get that out of my system! I am fine now. I will be reasonable. Bill, you can leave me either the Bird of Paradise or the Haviland Rosalinde. I would be content with either. They are both gorgeous! Thanks for the visual feast. I still want to know where you store all those sets of china and accessories. Do you have a china room? I can imagine the fight after the funeral! But I would be after the Blue Ridge. Those are just gorgeous, and since I live right next to the Blue Ridge Parkway, it would only be right, lol! You have some amazing collections, but what is really amazing is how you put things together in such an artistic way always leaving us wanting more. Beautiful images! Oh, I would love the Epiag Patelle, if for reason they weren't available I would settle on the Royal Doulton Prelude! 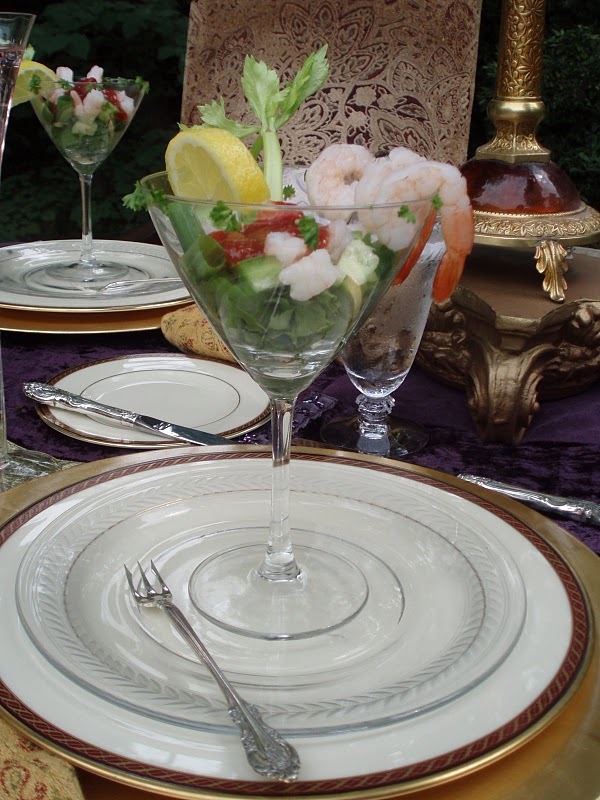 You have an amazing collection of beautiful dishes and all the accoutrements to set stunning tables. Thanks for sharing, Bill. Just getting a look at collection is enough for me. What a wonderful treat. Your talent to putting it all together sure brings out the beauty in each of them! Ever since buying a Taylor Smith Taylor oval vegetable bowl at a yard sale in a similar pattern, I've lusted for either Haviland Rosalinde or Homer Laughlin Jean. Or even a whole set of the TST. Then, you posted your Gosser American Ivy and I was in love all over again! You just have too many ways to tempt a china lover! I also loved it when you combined your Lenox Essex Maroon and Monroe. Being a quiltmaker, I always enjoy seeing patterns combined tastefully! There are so many beautiful patterns from which to choose. But...I wish I was the lady who planned to smash the cobalt blue dishes to use as a mosaic. That's what I would love to do, too. I am alway on the search for cobalt blue and green glass dishes just for this purpose. Hmmmm.....great minds and all that. Your collections is just amazing. My favourite china is American Ivy. It is very elegant and an excellent choice for a spring tablescape. Napoléon would have loved to dine at your table! Yep, 1940's Blue ridge can come over the pond anytime please!!! Do they have matching napkins?? I am pleased that you posted on china today as that is my favourite, I am not a glass person!! Great to receive your email the other day. Jackie in Surrey, UK. Hi Bill -- I've never visited your beautiful blog before, but thought I should because Gloria was so insistent. Well -- she does love these dishes (and you -- maybe, I think). I am a bit concerned, however, because she recently emailed me inquiring whether it required a certain license to drive a bus? Whether a standard car license would do or if a special license was required...hmmm. Well I just wanted to let you know. I'm sure she was teasing, right? I mean has she ever actually driven a bus before? Have I died and gone to dish Heaven? I would have a hard time choosing between Bird of Paradise and American Ivy. But, if push came to shove, I would go for Bird of Paradise. My mother's first dishes were Homer Laughlin Jean, and I love them. I believe they are the sentimental favorite of my dishes. Thank you for sharing the dream. Just beautiful dishes. I would not be able to choose. 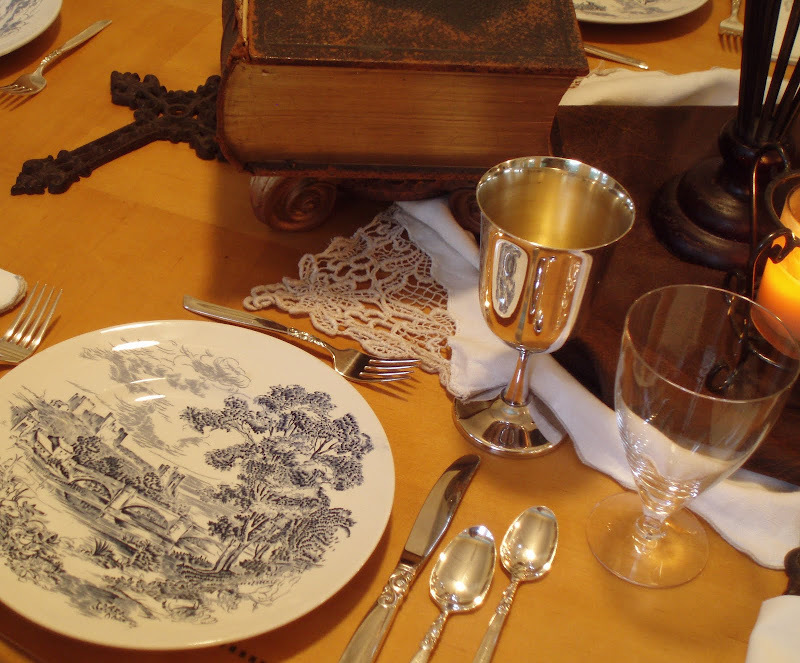 It's not just the dishes - the whole table and all the accessories compliment each other. This in in reply to Jan/Ms. Bobbypins above: I KNEW I should check in here at Bill's comments after your comment at MY blog, Jan! And didn't I tell you not to repeat those questions that I was asking you about a bus license?! Well, as I replied to you on my blog, our dearest Bill is safe since I gave him my powerful St. Joseph Prayer! He is all set and protected, and any bus would come to a screeching halt or skid into a pole or something, rather than hit Bill since the St. Joseph Prayer has made a protective bubble around him. There! Are you all satisfied? Your Bill is SAFE!!!! NO ONE's getting his dishes!!!! That Gloria is a smart one to try to get adopted by a man without children (hopefully I got that right, lol). Anyway, all of your tables are beautiful. 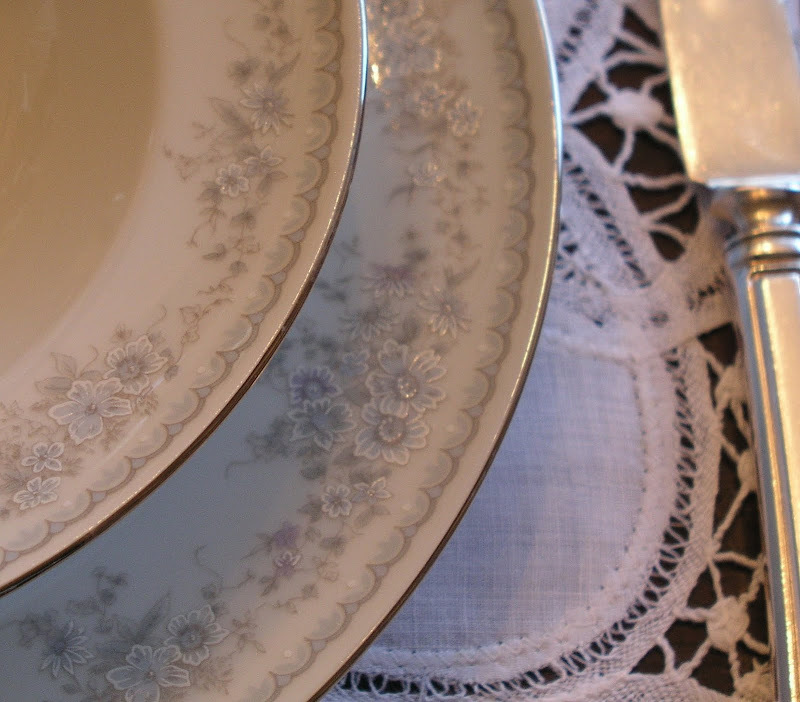 I especially love the Vintage French Haviland Limoges. I think it would go perfect with my Louis XV mirror (you can see the pick by clicking on my blog and then the header "my tablescapes". Just trying to beef up my case for the dishes. My other choice would be H & C/Heinrich (Bavarian) circa 1930's-1940's. Of course, you could really, really make by day by tossing over those Cambridge Rose Point goblets that you have. I love those and spied them in a few of the tablescapes above. I remember when I first saw them on your blog and my heart skipped a beat. Bill -- you never let us down with your lovely tables! They're all so beautiful. Now if I was "shopping" among this selection -- I would probably go stark raving mad trying to decide. But since I really don't have to -- I'll settle on the Paul Gosser American Ivy -- I have a "thing" for ivy and didn't realize so many others did too...until I posted my "Ivy League" tablescape last week. I'm always attracted to china and "accoutrements" from the 40's -- that's when my grandmother was a housewife with a young daughter (my mother). Even though she married and had my mother in the in the 30's they lived with relatives until they bought the only home I knew growing up -- A wonderful Victorian that they restored. This would have been the perfect china for that house! This comment is for Dream Mom above. (Yes, I am back, like a bad penny!!) You don't have to worry about Flowers!! Bill is the most excellent flower arranger that I have ever seen! I don't think anyone notices it because they are so busy looking at the dishes, flatware, glassware, but take a look at his Floral Arrangements!! GORGEOUS!!!! Oh, I thought this would be hard, but hands down, it's the Haviland Roselinde. You see, my grandmother gave me hers as a wedding present. She said I was meant to have them, since her name was Rose and mine is Linda. I treasure them so much, because she was such a fine entertainer. Your collection would enable me to serve more then eight! Bill, You will under no circumstances get hit by a bus!!! Do you hear Me????? Where would I go for inspiration.....but just in case....I love the Lenox Essex Maron! I think those are so beautiful and elegant. I also love the fancy chargers too! I would like to ask you... Do you actually use all the patterns or just showcase them? I think I would use a different pattern for every meal. Thank you so much for sharing and being my inspiration! You are truly blessed with flair! I absolutely LOVE all your dishes. They are exquisite. 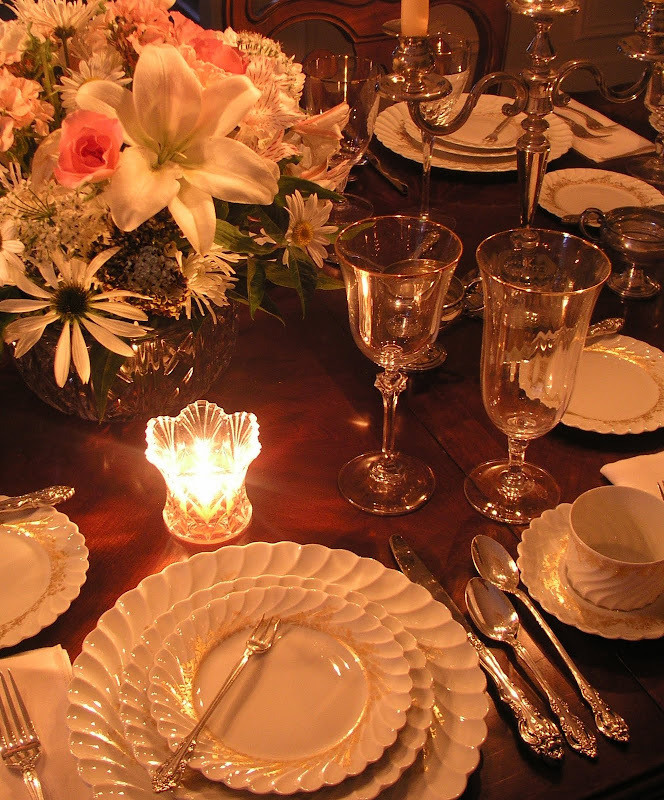 You have a talent for setting a beautiful table. I always look forward to your post on Tablescape Thursday. Please be careful and do not get hit by a bus! Thanks for a fun and dreamy post! Now, just stay away from those buses. We couldn't bear to lose you. Love the Theodore Haviland Concorde. Simple and elegant. Dress it up or down, or add some other pieces with color from a different set. Great idea to put this post together. May you live forever! Geez Bill you have so many sets of china where do you store them all??? But since you asked I would say the mix n match set of Haviland and Laughlin or the coronation set by Royal Doulton...and you can throw in your Foster pink stemware that you mentioned on an early summer table scape I had~I will glady take possession of those as well! Every tablescape you create is truly a work of art! You are such an inspiration to so many of us newbies, we need you around for a loooooong time. My favorite is the Royal Doulton Prelude. I just might have to start my own collection now...sigh. Bill, I thought I had a problem, but you've got me beat by a mile! (I think I only have 10 sets of dishes.) Now, I'm curious, how may place settings do you usually try to get? Since we actually entertain a lot and have a large extended family, I try to get a minimum of 12, but 24 is better. (Wait, make that 11 sets; I forgot the Heisey.) 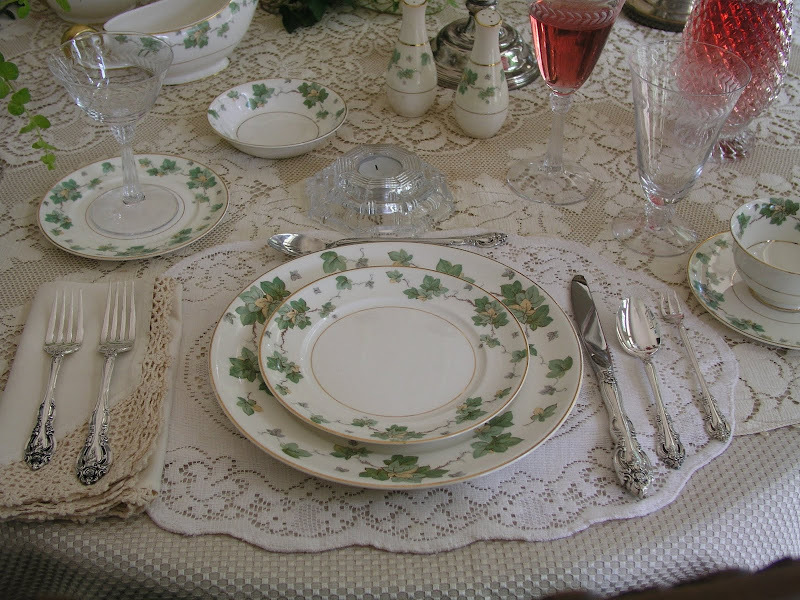 Anyway, I enjoyed looking at your dishes and if I should inherit a set, make it the American Ivy. Thanks for sharing. What a fun post! But honestly, my eyes are always drawn to the flatware. You have some vintage patterns that tug at my heart. When I was about 16 I got to pick out an Onieda pattern for my hope chest and have had a thing for it ever since. I've worked in restaurant supplies the last 20 years and have gotten so tired of the same old commodity patterns in our catalogs. Seeing everyones photos of other flatware is always a treat for me! I definitely hope and pray that nothing happens to you. I love them all but if I had to pick just one, I'd pick the Royal Doulton Prelude, it's just beautiful! I came last night, but I had to sleep on my choice. First I thought the blue glass, which I love. 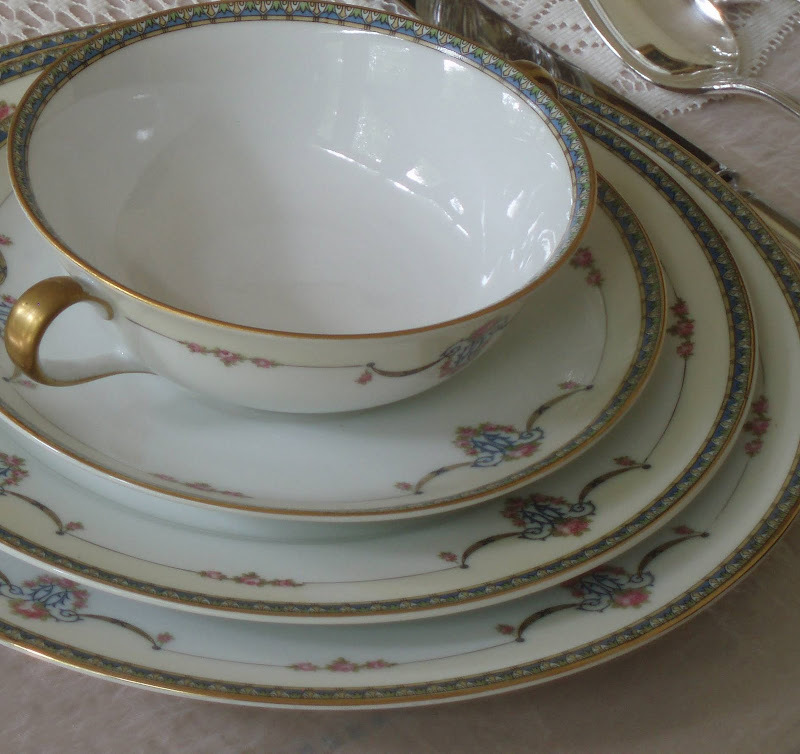 Then I decided on any of the sets with cream soup bowls, which I really love.Oh, ok, covet! It seems you have a lot of readers anxious for you to ......well, you know. Am I in the will? Bill, Since everyone has dibs on the dishes I'll put in my request for some of your lovely crystal stemware. Bill...they can all have your lovely china and crystal....may I have your beautiful home? Oh dear. That is a hard choice. I'll pick the Epiag with the birds or the Ivy dishes. I like several of your vintage patterns too. Of course, you could just leave me the Rose Point and call it done, Bill. Oh Bill...What have you started here? I am betting all these ladies will lose much sleep now dreaming of the possibility of inheriting their dream china. Am so glad the St. Joseph prayer has been bestowed upon you! As I commented in the original post, I've been shopping for my pattern for 28...29 years now but alas...it is found! Your post with the Laureate by Noritake ended my search for the most beautiful china. Then I went to Replacement.com to start my collecting...saw the price....I will probably never own a set of china after all! Do take great care of yourself. I'd much rather be indulged in viewing your weekly tablescapes than owning any of it. I loved th e H&C China. I don't care if it isn't a very large set. Also, you MUST do a post someday on where you store all this lovely china. I can't imagine where you keep it all. I've never posted before. I'm not a fellow-blogger, but I'm a lurker on any tablescape blog that I can find. Your tablescapes are always so lovely! With tongue firmly planted in cheek, I would be more upset if my daughters chose Corelle (over paper plates) as my nephews' wives did. Shudder! My favorites would be Blue Ridge & the Homer Laughlin dishes. I tease my friend who has so many different sets of china, she has to store some of them in the headknocker cabinet above the powder room throne. You two need to talk! She's thinking about adding on a room, just for all her gorgeous dishes. I am partial to Haviland, especially the Concord, but you have so many beautiful patterns. Gorgeous photography. Bill, who could choose...they are all so wonderful! I love them all...your taste is impeccable! French Haviland Ladore if your asking. I have always told people I am an orphan and am up for adoption. I am well behaved (snort, giggle) and clean up after myself. This is such a difficult decision. I would take them all and mix match them because that would be so fun but I love the Homer Laughlin Jean from 1944. It is such a delicate pattern. The Charter Club Country Chateau fits my house now and would be so flexible so they get a close second. I'm up for adoption, too, Bill! LOL! I dropped by tonight to check on you since I've been on a blog break for a month. This is a fun question. I like them all, but for fun, I would say the Blue Ridge set or Epiag (Czech) Bird of Paradise. I have similar ones to some of the other sets you have, so I would go for one of those two. A formal and an informal pattern. Perfect! I think you've started something here, Bill! Without the slightest hesitation, my choice would be Royal Doulton's Coronet....my wedding 'fine' china (circa 1964), which I had chosen for it's elegant simplicity. 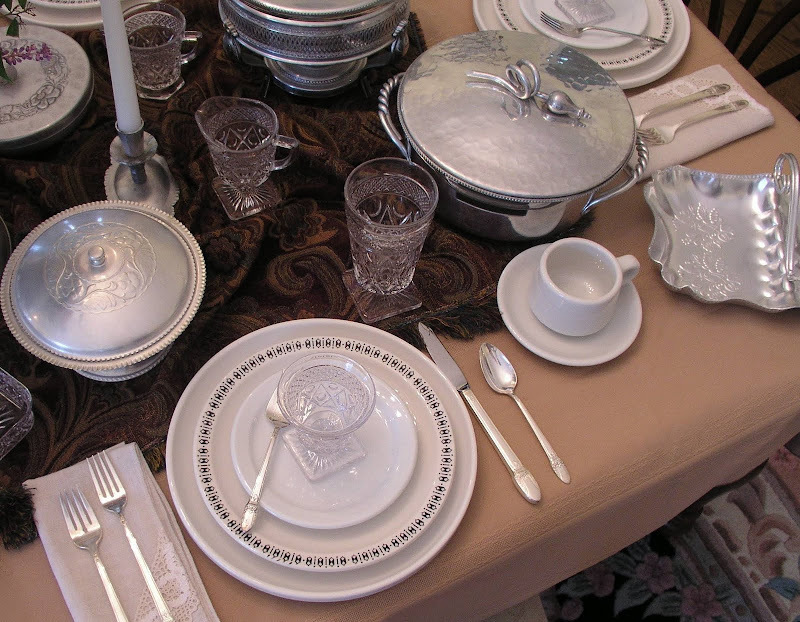 As it turned out, we received bunches of the everyday china choice, but only two place settings of the Coronet. Nevertheless, it's been much enjoyed for our candlelight dinners. What a fun idea! Love it all and would prefer if you just tagged a little something for me:@) Thanks for your great visit, Happy Labor Day weekend-enjoy! OMGoodness, Bill...I don't even like to TALK about your getting hit by a bus. Hope things are great in your world..you are such a sweetie. Bill, your dishes are all so beautiful! I'm just wondering where you find the room to store them all. I hope you're having a wonderful long holiday weekend. Wonderful Collection! Thanks for sharing them. The table setting are Gorgeous.Hugs. Fatima-Scrapart. I have just found your lovely blog. I will learn so much from reading your blog's previous as well as upcoming posts as I am salivating over your beautiful tablescapes. A very hard decision to make on selecting a favorite from your collection. 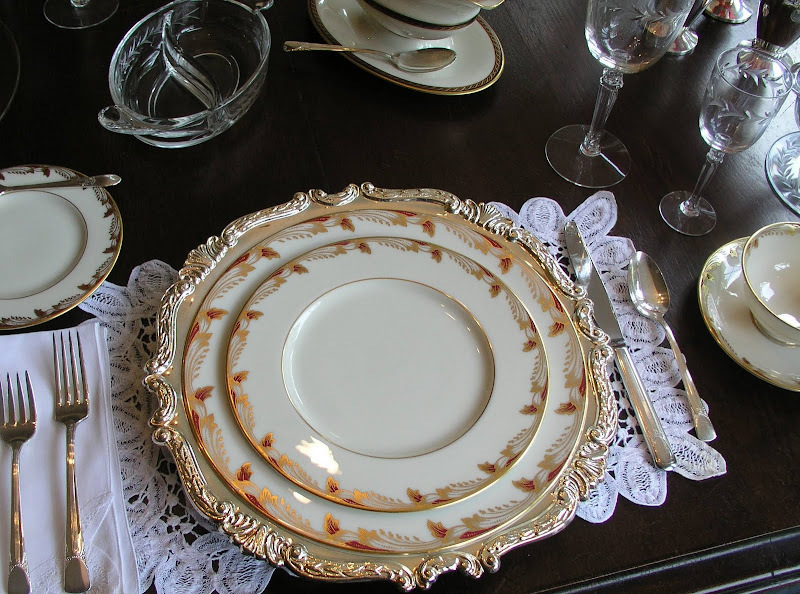 A close second is The Vintage French Haviland Limoges - very elegant. My first pick is the beautiful Epiag (Czech) Bird of Paradise - simply stunning! Yes indeed, I love that one Bill. But OMG I love them all! You have an amazing collection and I love that you shared it with us today. Bill, How lovely they all are! My very favorite is the Myott Staffordshire Medici - so elegant and beautiful! I absolutely love them. You have a wonderful collection, Bill, and your attention to all the little details makes for truly beautiful tablescapes! I really am in awe! Sorry that I've been out of the loop for so many months now. Summer has a way of doing that. Keep doing what you do, Bill. That's legacy enough for all of us. I will leave the dishes for all of your other friends since I collect red and white transferware, but if you could find it in your heart to put "Jaybird" on the Canterbury glass, I would be so appreciative :^) That was my Mom's pattern, and is fairly hard to locate. I use what I have a lot, so it is still being loved a bunch!! I have enjoyed reading your blog, and appreciate all of your hard work! I think all of the your china ia lovely but my favorite is Myott Staffordshire Medici. It is so elegant. It reminds me a little of my Lenox Fontaine which I acquired via craigslist. I am a new follower of your blog and love it! The Myott Medici are my very favorites...where do you store them all? I'm having a devil of a time trying to store all my sets and your miles ahead of me in collecting. Wishing you good health so you can enjoy all your lovely treasures.